(Paraphrased from Joseph Tabrar - 1892). Tricia has spent a long time organising aperitifs garni for Christmas Eve (It is like coming round for an early evening drink, but with a few snacks thrown in). And it does take a lot of arranging to ensure that your favourite people have the chance to attend, get fed, and do not make the foolish mistake of attending inferior events with a similar theme. This planning included Tricia's prescient decision to do the shopping a couple of days earlier than usual as her version of 'a few snacks' is a full blown meal in snack form. We get up on the morning of the 24th to find the whole place ankle deep in snow which looks lovely and not very threatening. The shopping is in so there is no need to drive anywhere and we get on with de-pig-stying the place in honour of our guests, and preparing the small barn for it's first test run as a party venue. I have promised to drive the 73 metres up the hill to collect our neighbours, Lucien and Juliette. Lucien is struggling on with a dodgy hip and walking is not so easy, especially if it involves hills. Some hours later I think the sensible thing is to test the effectiveness of the transport system (OK, try driving the car up the lane) before it is needed and am scuppered at the first hint of a gentle slope. Nothing moves (unless you count spinning wheels). This does not bode well for collecting L&J. Always on the lookout for an upside, I think that if I can’t get the car up to their house, there is no way our guests will be able to get up our similarly steep hill, so L&J will not be missing out as we will have to cancel. As upsides go this is not a particularly satisfactory example and, with a premonition of dread and foreboding, I return to the house to tell Tricia the news. She, up to her elbows in canapés, is surprisingly pragmatic and suggests I email our guests to let them know that we will be cancelling. In an attempt at optimism I send an email saying that the forecast is good and that it may thaw out and to watch this space. A thought drifts through the nether regions of my sub-conscious ‘If only I had a snow plough’ it taunts... This notion finally surfaces with the realisation that I do indeed have the makings of a snow plough. I have a tractor, I have a grader blade (think bulldozer) and I have the means to attach one to the other… somewhere. The grader blade is buried under some timber. The ease of finding it is countered by the difficulty of carrying it through the clutter-laden hanger (open-sided barn) and across the snow to the tractor. Fortunately when I put it away I had greased the fittings. Unfortunately this was several years ago and they needed a severe talking to with a hammer to do the decent thing. Then I realise that there is a bit missing. Some time later I find it in the cave and fit the blade to the tractor. The problem then is that I cannot raise or lower the blade and have no control over the ploughing activity. I finally find and fit the lever that can do the job provided I can find a suitable link between lever and blade. Blimey! I think, and begin to imagine this might actually happen. The reason I had put the blade away in the first place was a lack of a suitable steel rope to lift the thing. But in the intervening years I have had the item on my subliminal list of things to acquire and thought that I had found something some time ago – but where had I put it? In the steel rope box obviously. 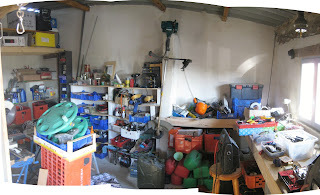 This is the one box I can not find in the workshop (there is a whole thesis in the notion that there are any number of other boxes I could not find, but I was not looking for them so this one took on the role of ‘missing box', but I digress.) I conduct a rigorous search using a torch in broad daylight (another thesis in the making: it helps focus the mind and reduces the temptation for the eyes to jump around at random, but I digress again). The steel-rope box finally turns up complete with a small tin box of ‘dogs’ (fixings for steel-rope) and the fitting proceeds. Thinking all the while of how my colleagues in the rigging industry would have dispised the botch up, I fashion a crude (but effective) linkage. There are two ways one can place the dogs on a loop of steel rope and there is an aide memoire which describes it. Trouble is I could not remember the words [A bit of a failure as an aide memoire, then. Ed.]. This was further complicated by the inability to remember the particular rigger’s jargon which describes the elements. All I could remember is that it has something to do with hanging a, possibly dead, horse, or it may have been some other domesticated beast, and maybe not hanging it but restraining it by some other means. 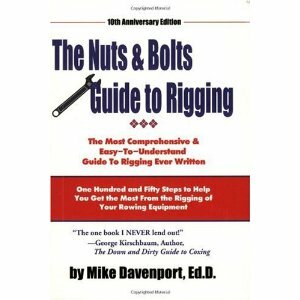 It's at times like this that you need Mike Davenports splendid Guide to Rigging. Like the half remembered lyric of a long forgotten song the ghost of the missing phrase rattles around in my mind. Then my frozen hands take the decision for me. “Just bloody do it.” they say, “Sod the right way, just get the damn thing on so we can crawl back inside your nice woolly gloves.” Talking hands, marvellous! ...the lane is cleared and the question of how the man who drives the snow plough gets to work is answered. PS A second email was sent “If you can get out of your place, you can get into ours. See you as planned.” L&J are collected, tout le monde turn up, and a splendid evening ensued.